Once again, GGP is before you asking for more alteration of the LDA for the Reed Putnam sites. The world class mall developer who came before you a few years ago with their expert assessment of how to develop this mixed use designated parcel in a way that was economically feasible and harmonious with Norwalk’s needs is now admitting that they are floundering and they want you to help them make their numbers work. They should be held accountable for their own failure to plan, as all commercial enterprises should. They are currently asking to remove the hotel component, but we should look hard at asking for more, instead of settling for less. 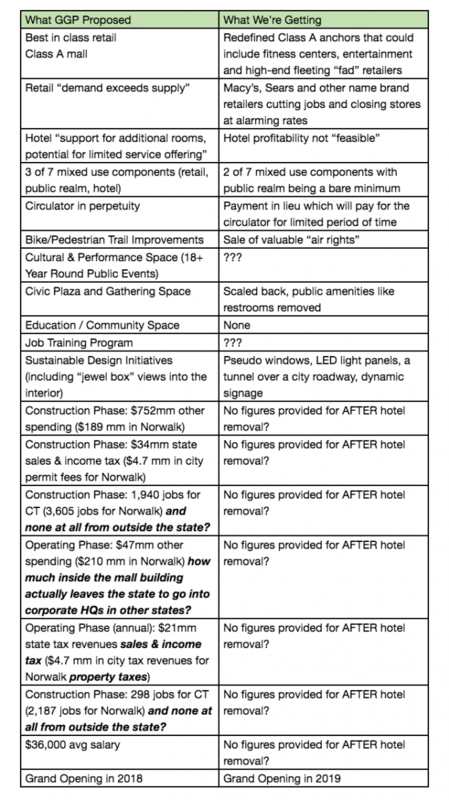 Logically, removing the public realm space as “not economically feasible” makes more sense than removing a revenue-producing hotel, since it is not a revenue producer at all. GGP has not proposed removing this public realm space (though it has been steadily scaling it back through “minor” changes reviewed by zoning) because it really isn’t public realm, but augments the only remaining use—retail. The hotel space capacity proposed before the LDA amendment for GGP was 145 keys. GGP proposed approximately 150 keys (and assumption in the report is 138 keys). Is it possible to explore a smaller hotel (or a larger one) to nudge the profitability figure from 7.62% to a figure closer to the 8% that GGP is insisting is the feasible figure? Would 7.8% do the trick? Would 7.9%? The fact of the matter is that the City has agreed to pretty much everything GGP has asked for (including the disposition of historic burial remains) as it slowly scaled the project back from one that met the objectives for the Urban Development Plan and the expressed desires of the community through a year and a half of public information and input sessions (except for a 100% tax abatement in the upfront years). It has lost almost every single negotiated element of the LDA and received pennies on the dollar in payments in lieu of services. Norwalk expedited its approval process with joint meetings of key agencies, governing bodies and departments to meet a “must” opening date in 2018, even as it lacked resources to deal with the Walk Bridge. In return, it has lost approximately $4.7mm in property tax revenues as GGP dithered to negotiate scale back of its public realm requirement, the numbers and types of restaurants, favorable parking configurations and digital signage. That tax revenue would have been collected had GGP met its own “drop dead” opening date—now delayed a full year. Create development opportunities for an appropriate mix of uses, including office, retail, residential, hotel and non-profit institutions. With the removal of the hotel, the last fig leaf of mixed use falls away, as the objectives for the site did not include “public realm”. It does NOT enhance public access to the Waterfront, and the additional traffic and demand on public transportation may depress interest in the area further. This does NOTHING to increase housing opportunities for the residents of Norwalk, and (combined with the next point), may in fact increase competition for affordable housing for residents that want to remain in the redevelopment area. While the project technically increases employment, the average salary (before removal of the hotel) was projected to be $35,000. An “affordable” one-bedroom apartment of $1,200/month would exceed 40% of the income of the average worker. Given that 88% of those jobs in the operating phase (before the removal of the hotel) were expected to come from Norwalk, it’s hard to see how this won’t create a housing crisis for the urban poor. Disturbing also, are some of the assumptions used in pinnacle’s report to determine the feasibility of the hotel. The assumptions for the facility are in stark contrast to the “limited service” hotel that was the only option GGP considered viable in 2014 (a time when the FD Rich property was already approved and known to be part of the future competitive landscape). These assumptions look designed to produce the “unfeasible” outcome. Lastly, the payment in lieu of property taxes cannot be properly assessed for its value in relation to the change without information about the changes to the other economic components when swapping out retail for hotel. Will there be an equal number of retail jobs gained for hotel jobs lost? Will the average salary go up or down? All of the fiscal impact figures in the HR&A report seem to echo the numbers from the project as proposed BEFORE the removal of the hotel (except the tax revenue figures have been updated to current year dollars) and do not discuss the new figures AFTER the removal of the hotel. The only upside to this scenario is that the flat tax payments up front won’t be subject to GGP’s legendarily aggressive tax assessment appeals. Like the frog in the boiling kettle, Norwalk has been slowly brought from the objectives of the Urban Development Plan and the LDA for mixed use to GGP’s original and ultimate goal—a giant, regional, fortress mall with digital signage—all retail, all the time. They have insisted that we meet their objectives for project timelines and opening dates, and their own benchmarks for profitability. We have insisted that they meet—well, very, very little, so long as there was a $ in front of it. If, in all fairness, you could look at the new version of this project as if it just walked in the door as a brand new development proposal, and would approve it without any further negotiation, then go ahead and approve the amendment. But, if you would change even one thing in the name of all of the residents and businesses who were sacrificed to make this parcel available, then I implore you to go back and get some more value for the citizen of Norwalk. Excellent piece, Deborah, and perfectly on point. File the GGP development proposal under WBD–We’ve Been Duped. Thank you for posting my letter, but the headline misses my point. I am not advocating for removal of the public realm. I was simply pointing out the illogic of trying to improve the economics of the project by removing a revenue producing component. The naked calculation here is that keeping public realm preserves the fig leaf of “mixed use”. It should be clear that my premise is that the council should not hold the city responsible for the economic success on the mall after compromising dozens of desired items in previous rounds of negotiations. Exceptionally well presented. My only dissent is that the mall should never be built. The logic from current facts is undeniable. I’ve said it for 2 years now. The CC should cowboy-up here and realize the cards they hold – and the legacy & responsibility they hold – on behalf of Norwalk now – and more so, for the next 10-20 years. If we must – if we are n fact “in too deep”, then in the very least we need the top-side of the deal. The frog analogy is devastatingly accurate. 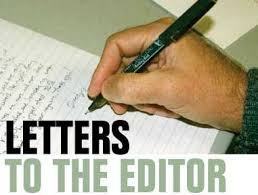 Another great piece advocating the elimination of the mall together with the revenues from the City’s coffers and the jobs for Norwalk residents. If these ideas were really that “great” someone other than GGP would have made them happen years ago. I am tired of driving by an empty lot; talk about something that is a detraction from the City. Let GGP invest their money a mall which will benefit both our residents and City finances. I have never believed that a mall would be the right thing for Norwalk. We would suffer all of the impacts from its infrastructure and get very little in return. What’s more, it could be a very large anchor on moving forward with any successful city planning or economic development when ee finally get around to seriously doing those things outside of the redevelopment area. However, yesterday’s vote was about whether to open up the LDA (again) in a hostage situation to give GGP (more) of what they want without due consideration to the citizens of Norwalk. We must let our councilmembers know what we want if we expect them to represent us. I must admit i am truly disappointed at last night’s vote. Members of the public ought to know that the Redevelopment Agency has scheduled a special meeting for TONIGHT @ 5:30 pm to continue the rush on this amendment. I urge everyone who is interested in this project to not only continue commenting here, on other news sites, and on social media, but to show up at meetings, whenever possible. Starting tonight! Redevelopment Agency commissioners will hear directly from GGP, the details of the requested modifications. 5:30pm Room 300, 3rd Floor City Hall.